10 Brussels Griffon you need to follow on Instagram - helloBARK! Fact Checked This article was fact checked by one of our writers on November 30, 2018. Brussels Griffon are one of the most popular breeds on Instagram. They are real power players thanks to their faces that are almost human-like, their pinned-back ears and magnificent beards. It isn’t difficult to see whether these dogs are grumpy, happy or upset. Brussels Griffon are very good at expressing emotions. Jack Nicholoson helped to put the breed in the spotlight when he starred alongside a Brussels Griffon in Oscar-winning film, As Good As It Gets. As their name suggests, Brussels Griffon originated in Belgium but have become a worldwide phenomenon since the age of social media. While they remain quite a rare breed, these adorable little dogs have left their mark on social media. Proving that big things come in small packages since 2017, Squid (@squidthegriff) is a Brussels Griffon based in Australia. This cheeky chappy is always quick with a clever caption. Not afraid to dress up in an outfit, Squid provides plenty of giggles for his Instagram followers, which stands at almost 200,000. Did you know? 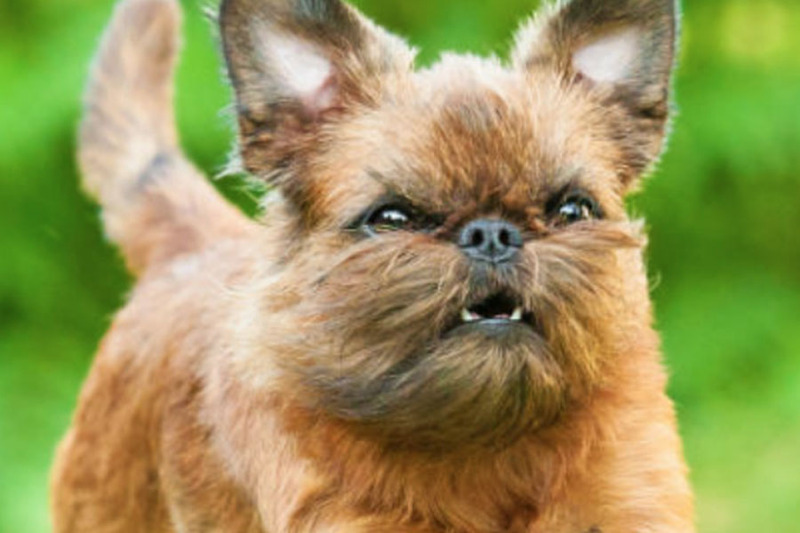 Brussels Griffons are thought to be descendants of an old Belgian dog called Smousje, whose primary function was to hunt small rodents in stables. Digby and Aloysius (@digbyvanwinkle) are a pair of Brussels Griffons based in New Zealand. This duo aren’t afraid to get down and dirty, whether it be on the beach or walking in the woods. Sporting full beards that would leave any hipster green with envy, Digby and Aloysius are small dogs with big personalities. Fact attack: Brussels Griffon Verdell won the acclaim of Hollywood when he was part of the cast that won an Oscar for As Good As It Gets in 1997. Trying to make it in the hustle and Brussel of New York City, Brussel Sport (@brussels.sprout) was one of the first Brussels Griffon to achieve Instagram fame. With a face that is so expressive, it’s no wonder this NYC pooch has 113,000 followers on Instagram. Quick to don an outfit or a pair of shades, this is one cool pup. Did you know? Marie Henriette of Austria, who is also known as the Queen of Belgians, helped Brussels Griffon to become more popular in Belgium. Named after musician Glenn Danzig, Bart and Blaine (@danzigbros) are two Brussels Griffon living a rock n’ roll lifestyle in Los Angeles, California. With smooth coats, this pair are precious duo who will fill your Instagram feed with colour. They are quite the social pair, often posing alongside their pug and husky pals. Fact attack: The Petits Brabancon is a variety of Brussels Griffon that is a toy breed similar in appearance. They have also managed to achieve great popularity on social media for their adorable little faces. The King of Los Angeles, Chamaco the Griffon (@MYNAMEISCHAMACO) likes to mix with the stars in the city of angels. Whether it’s Darth Vader or Hello Kitty, this pooch can often be found wearing a costume or a mask. This little superhero has 25,000 followers on the photo-sharing app. Did you know? The Brussels Griffon tend to be found in four different colours: red, a black and red brown called belge, black and tan, and black. One part of Bing and Walter (@bingandwalter), Bing is an adorable Brussels Griffon. With a sibling of a different breed, Bing proves that this breed tend to be sociable and get along with other dogs. With almost 35,000 followers, Bing is sure to light up your Instagram feed. Fact attack: Brussels Griffon were created using a number of different breeds, including black Pugs, King Charles Spaniels, the Ruby Toy Spaniel and the Affenpinscher. What’s better than one Brussel Griffon? No the answer isn’t two – it’s six! Bentley Oliver Nala Elliott Indie and Monroe are all part of the Bone Squad (@the.bone.squad). Described as six tiny humans trapped in brussels griffon bodies, you can definitely get your Brussels Griffon fix on this Instagram account. Did you know? Brussels Griffon tend to average between 9 and 11 inches (230–280 mm) tall, while their average weight is between 8 to 10 pounds (4–5 kg). His bio says he is a well dressed Brussels Griffon living in the less fun part of New York, Bruss Griffin (@mister_griff) is a stylish dog the Empire State. This Belgian dog looks good in a suit – he’s quite the dapper pupper. Almost 25,000 followers are enjoying his colourful adventures around NYC. Fact attack: Brussels Griffon usually have two different coat types: rough coat or smooth coat. They also sport trademark beards. Simply described as a “catfish monkey dog” in their bio, Gogo (@gogogriffon) is a Brussels Griffon who loves to dress up. Whether it’s St Patrick’s Day, Easter, 4th of July, Thanksgiving or Christmas, this dog can be found rocking an outfit to suit the occasion. Did you know? 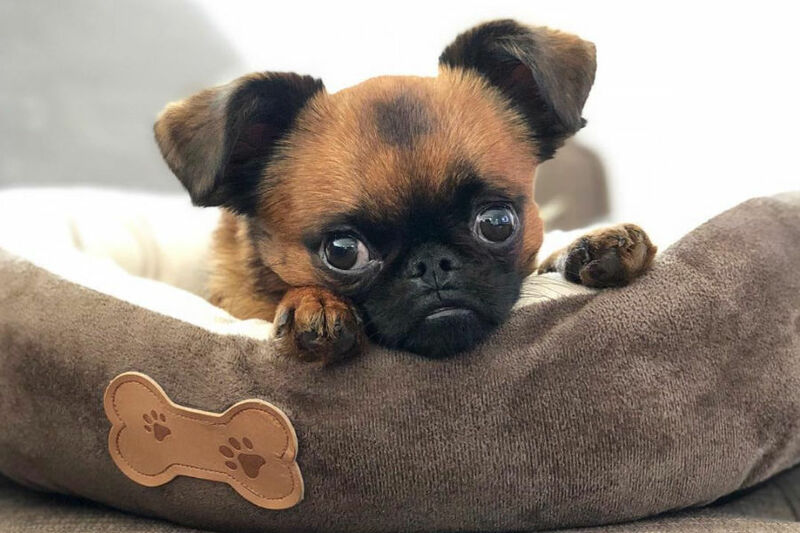 Brussels Griffon dogs have an average life expectancy of 12-15 years, which is a great age considering the breed do have some health problems. Andy and Pipi are another Brussels Griffon double act. This pair (@andy.griffon) love to snooze, snack and play in New Zealand. Andy is a black Brussels Griffon with a beautiful black hair and gorgeous brown eyes. Pipi is a fawn Brussels Griffon with an equally well-groomed mane of hair. Fact attack: These dogs don’t come cheap, which probably should be a surprise given their unique looks. Indeed, if you want to own a member of this breed, you should be prepared to pay between $800-$4,000. Pretty Little Liars actress Ashley Benson has a little Brussels Griffon called Walter. The blonde actress often posts photos of her gorgeous dog much to the delight of her 19 million Instagram followers.